We were so captivated by how beautiful bride, Jodi, looked in our Pearls of Drama Necklace that we featured one of her gorgeous wedding photos on Facebook. It proved to be so popular with our followers who clearly adored her style so we just had to share her more of Jodi’s stunning wedding with you. Jodi and Matthew met on a night out and quickly became inseparable. Jodi explains “we were engaged for two years before we got married. We booked our venue, band & photographer straight away, but the real planning didn’t start until the year before. The panic planning then set in after Christmas. I found I had lots of good ideas and Pinterest was my best friend”. We love how Jodi says “in my head I am a lot more artistic than I am in reality”. Thankfully Matthew’s Mum and Auntie are extremely creative and made Jodi’s beautiful bouquet and her flower girl’s dress. Jodi and Matthew chose talented photographer Craig Ramsay to capture their special day. For Craig photography has been a lifetime passion. He told us that he first got the bug when his picked up his father’s film camera as a child in Hong Kong in the 1970s – and since then, he has made it his life’s work. Craig has covered weddings everywhere from the rugged outdoors of the Scottish Highlands to the dazzling high rises of Hong Kong and even under the shimmering waters of the Coral Sea in Australia. Today, Craig divides his time between Scotland and Asia, giving him the chance to shoot weddings in a wide variety of locations, settings and cultures, keeping his passion for first class photography burning more strongly than ever. For a wedding, Craig feels it is his mission to perfectly capture the magic moments that make a wedding day so special. 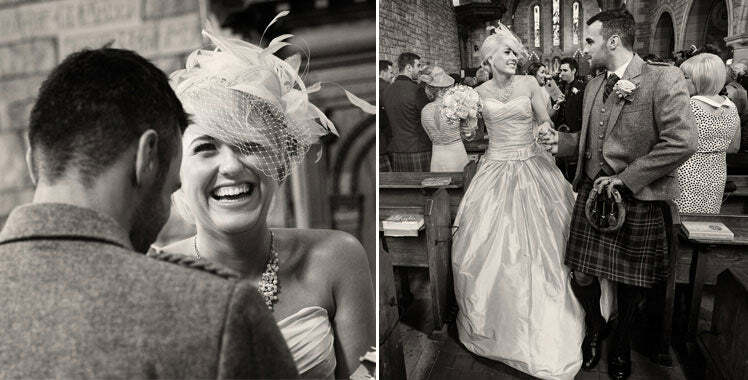 His pictures reflect the natural emotions and the sheer joy as a couple’s big day unfolds. For Jodi and Matthew’s wedding, Craig’s inspiration was to “make their story unique by capturing those special moments that happened on their special day before they disappear into the ether (often without the bride and groom being aware that they had been captured). I wanted to capture the complete story so covered everything from preparation in the morning until the band had laid down their instruments. This combined with making sure that, for the editorial style shots, the couple looked like they had walked off the cover of Vogue”. 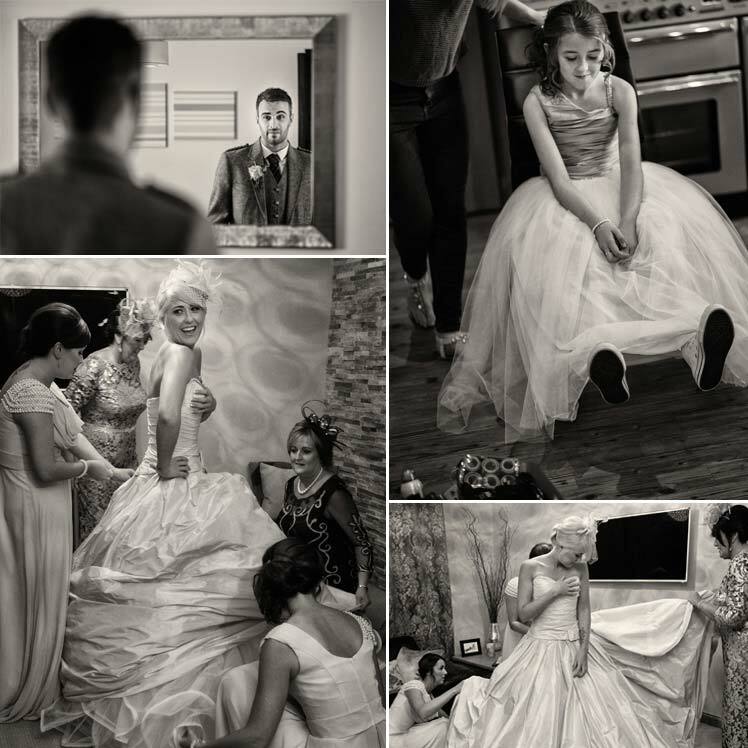 We are sure you will agree that Craig’s images have captured the romance, fun and beauty of a wonderful day. For her special day, Jodi chose a statement dress by Ian Stuart. His “Blueberry Hill” pale gold taffeta dress was the complete opposite of the straight, long sleeved, backless dress Jodi had envisaged. Jodi jokes “for some reason my mum picked it out for me to try, I put it on and refused to take it off. Just shows, Mum’s always know best!” She also liked the fact “that no one else expected me to wear what I did!” As her dress was plain yet classic, Jodi felt our “Pearls of Drama Necklace really gave it an edge”. As you will see from the photos, Jodi and Matthew had the most amazing wedding day which they were thrilled to share with their family and friends. Every moment is special but Jodi told us about the highlight of the day for her: “After the ceremony when we went away in our car to have our photos taken. It was like the calm in the middle of the storm, we just had a few drinks and some fun. We were lucky we got on really well with our photographer – people used to tell me they hated getting their photos taken, it was such a chore. We were a little apprehensive as neither Matthew nor I are big on posing, but Craig just made it feel so easy”. Jodi’s advice to every bride-to-be planning a wedding is “book people you like and can happily have around the whole day. Craig was with us from 8.30 in the morning until 1.30 the following morning, but it was just like having another friend there”.